On the fifth day of Christmas, my Wingstop gave to me…five boneless wings! The new Highland Wingstop, 27993 Greenspot Road, opens tomorrow (December 20) and the first 200 customers there beginning at 11 a.m. will receive a free five boneless wing combo. 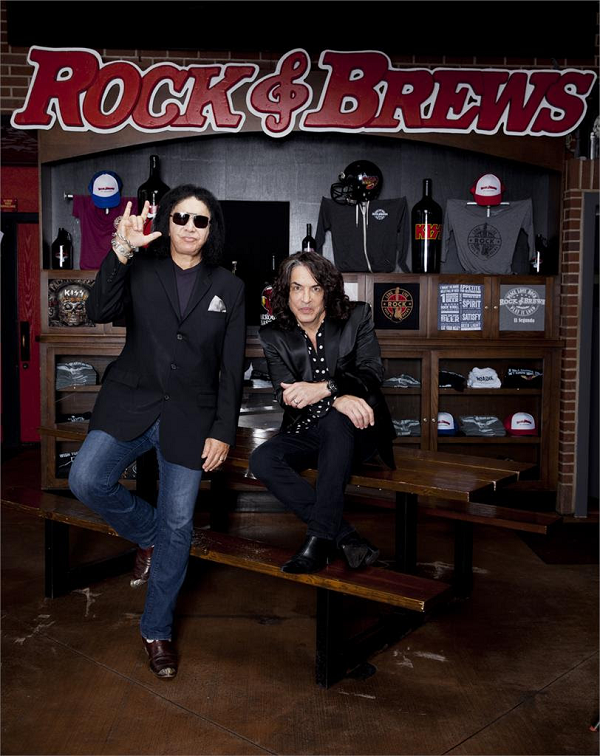 Although the new Rock & Brews restaurant at San Manuel Indian Bingo & Casino has been open for a little while, the eatery is hosting its grand opening tomorrow (December 6) featuring two of its co-owners: Paul Stanley and Gene Simmons of KISS. Fans are welcome to attend the grand opening and meet the rockers during the event. San Manuel Indian Bingo & Casino’s Pines Steakhouse is hosting a three-course Herreradura tequila-pairing dinner tomorrow night (March 7). First course, paired with Herradura Silver, consists of a strawberry and queso fresco salad with a mint lime vinaigrette and tortilla soup. The entrée is a petite filet mignon with grilled Mexican white shrimp, served with garlic mashed potatoes and seasonal vegetables. It’s paired with Herradura Reposado. Dessert is Mexican chocolate molten cake, served with vanilla ice cream, and paired with Herradura Anejo. Perhaps you missed your opportunity to “ketchup” with the Oscar Mayer Wienermobile to get a wiener whistle when it was in San Bernardino for the Route 66 Rendezvous last year. You’ve got another chance this weekend as the Wienermobile will be making an appearance at the Highland Walmart (which technically is in San Bernardino). You’ll be able to “meat” hotdoggers Jess Grillin’ and Tailgating Theresa, who will bring the iconic vehicle (which is one of six traveling the U.S.) to newly remodeled store, 4210 E. Highland Ave. The pair will be handing out coupons for $1 off Oscar Mayer Select meats and, of course, the whistles, from 10 a.m. to 4 p.m. Saturday (February 9) and Sunday (February 10). Longtime Highland business Far West Meats suffered a devastating fire two years ago, and had been operating out of a temporary location in Colton with limited capacity. The company spent $3 million rebuilding and expanding its Highland plant and filling it with state-of-the-art equipment. There was a ribbon-cutting ceremony early last month. From 9 a.m. to 3 p.m. Saturday (July 14), the company is holding a grand re-opening celebration at the Highland plant, 7759 Victoria Ave., that is open to the public. Far West Meats is the Inland Empire’s largest meat packer. You’ll be able to sample beef brisket, ribs, chicken, hot dogs, burgers and Far West Meats’ famous hot links during the open house. Update: Far West Meats is reporting that they had 1,500 hungry people show up at the event, including one local food blogger, who sampled some delicious chicken chorizo, some stewed pork and a hot link. Yum! Click here to read Rachel Luna’s recap of the event. It’s been a long time coming, but the Highland In-N-Out Burger, 28009 Greenspot Road, is finally open! I noticed the other day that the restaurant’s logo was now part of the center’s sign, and today I drove by to check on progress. That’s when I discovered it was open. Apparently, word travels fast, because the drive-thru line was ridiculously long and the parking lot was packed. Welcome to Highland, In-N-Out! What took you so long? We’ve been following the saga of the Highland In-N-Out for several years now, and it appears that the location will very soon be a reality. The building at 28009 Greenspot Road is nearly complete. Applications are now being accepted online, and the company will be interviewing from 9 a.m. to 4 p.m. March 14 and 15 at the National Orange Show Events Center’s Backstretch Amphitheater, 689 S. E St., San Bernardino. A sign at the location advertises wages at $10 an hour. There’s another new 7-Eleven in town! This one’s at 3588 E. Highland Ave. in Highland. The grand opening will be from 10 a.m. to 2 p.m. tomorrow (July 16). Highlights include Laker Girls, Power 106 DJs and…free Slurpees! If you’ve ever been to San Manuel Indian Bingo & Casino, you might’ve had a bite to eat at the SportsWatch Grill. The tribe is taking the concept on the road. Well, down the street anyway. The SportsWatch Bar & Grill has opened in San Manuel Village, adjacent to the recently-relocated Mi Cocina. A ribbon-cutting ceremony was held Monday (June 13), and a grand opening set for Saturday (June 18) with L.A. Dodgers legend Fernando Valenzuela signing autographs at 11:30 a.m. and longtime L.A. Kings player Marty McSorley making an appearance at 1:30 p.m. The first 500 diners Saturday will also get a free T-shirt. A drive-by last week before they opened revealed a very upscale and trendy space, with a staggering 54 HDTVs situated throughout. The SportsWatch Bar & Grill is at 27961 Highland Ave., Suite B, in Highland. Click here to read more, from the business page of The Sun.